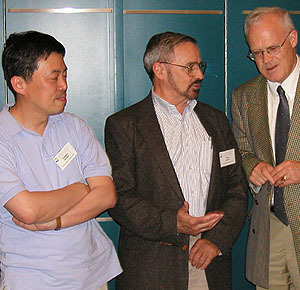 Professor Manuel (center) discusses research on the composition of the Sun with (on the left) Professor Fumihiko Suekane of Tohoku University's Research Center for Neutrino Science in Sendai, Japan and (on the right) Professor Dr. Hans Klapdor-Kleingrothaus of the Max-Planck Institut fuer Kernphysik in Heidelberg, Germany. Our group uses stable isotope mass spectroscopy to study the origin of elements in the solar-system, the Sun's composition, source of luminosity and rare modes of nuclear decay. "Fingerprints of a local supernova," O. Manuel and H. Ratcliffe, to be published in "Supernova Research", Nova Science Publishers, Inc., Hauppauge, NY, in press, 2008. Isotopes Tell Sun's Origin and Operation", abstract of paper to be presented at the First Crisis in Cosmology Conference in Moncao, Portugal, 23-25 June 2005. O. Manuel, W. A. Myers, Y. Singh and M. Pleess, "An Iron rich Sun and its source of energy", in: Proceedings of the 8th International Symposium on Nuclei in the CosmosVancouver, BC, Canada, July 19-23, 2004. O. Manuel, "The Need To Measure Low Energy, Anti-Neutrinos (E < 0.782 MeV) From The Sun", Physics of Atomic Nuclei, in press (2004). O. K. Manuel, B. W. Ninham and S. E. Friberg, "Superfluidity in the solar interior: Implications for solar eruptions and climate", Journal of Fusion Energy 21, 193-198, 2003. O. Manuel and Stig Friberg, "Composition of the solar interior: Information from isotope ratios", Proceedings of the SOHO 12 / GONG+ 2002 Conference on Local and Global Helioseismology: The Present and the Future, 27 October-1 November 2002, Big Bear Lake, CA, U.S.A. (ESA SP-517, editor: Huguette Lacoste) pp. 345-348 (2003). O. Manuel, E. Miller, and A. Katragada, "Neutron repulsion confirmed as energy source", J. Fusion Energy 20, 197-201 (2003). O. Manuel, "The standard solar model versus experimental observations", Proceedings of the Third International Conference on Beyond Standard Model Physics - BEYOND 2002 (IOP, Bristol, editor: H. V. Klapdor-Kleingrothaus) pp. 307-316 (2003). O. Manuel and A. Katragada, "The Sun's origin and composition: Implications from meteorite studies", Proceedings of Asteroids, Comets, Meteors (ACM 2002), 29 July - 2 August 2002, Technical University Berlin, Berlin, Germany (ESA-SP- 500, editor: Barbara Warmbein), pp. 787-790 (2003). O. Manuel, Cynthia Bolon and Max Zhong, "Nuclear systematics: III. The source of solar luminosity", J. Radioanal. Nucl. Chem. 252, 3-7 (2002). O. Manuel, C. Bolon, A. Katragada and M. Insall, "Attraction and repulsion of nucleons: Sources of stellar energy", J. Fusion Energy 19, 93-98 (2001). Adam Nolte and Cara Lietz (Student Members of UMR's Jupiter Team, headed by Dr. Manuel), "Abundances of Hydrogen and Helium Isotopes in Jupiter", in The Origins of the Elements in the Solar System: Implications of Post 1957 Observations, O. K. Manuel, Editor, Kluwer Academic/Plenum Publishers, New York, NY, pp. 589-643 (2000). David Arnett, "Supernovae and Nucleosynthesis: An Investigation of the History of Matter from the Big Bang to the Present", Review: American Scientist 85, pp. 478-479 (1997). O. K. Manuel and D. D. Sabu, "The noble gas record of the terrestrial planets", Geochemical Journal 15, 247-267 (1981). O. K. Manuel and D. D. Sabu, "Strange xenon, extinct superheavy elements and the solar neutrino puzzle", Science 195, 208-209 (1977). O. K. Manuel, E. W. Hennecke, and D. D. Sabu, "Xenon in carbonaceous chondrites", Nature Phys. Sci. 240, 99-101 (1972).